Outsiders may envision Georgia Tech as some futuristic mothership where super-intelligent scientists-in-training walk side by side with robots. And they may be right. In recent years, professors and students at the Midtown campus have developed artificial intelligence that can feed you, bathe you, and practically tuck you in. Someday they may take over the world—in a good way. If not, meet your future overlords. The PR2 (Personal Robot 2) was developed in California, and Tech researchers have modified a version to work with seniors as a service bot. Imagine it delivering your medicine. In 2012, we named it an Atlanta Magazine Groundbreaker. Using laser range finders and cameras, combined with pressure-sensitive joints, Cody can give sponge baths, which has real-world implications for the elderly or bed-ridden. Drop your credit card? Use a wheelchair joystick to direct this bot to scoop up (like a dustpan, hence the name) and lift an object weighing less than a pound. Individually these little guys are glorified remote-controlled cars, but together they can assemble themselves into letters of the alphabet. 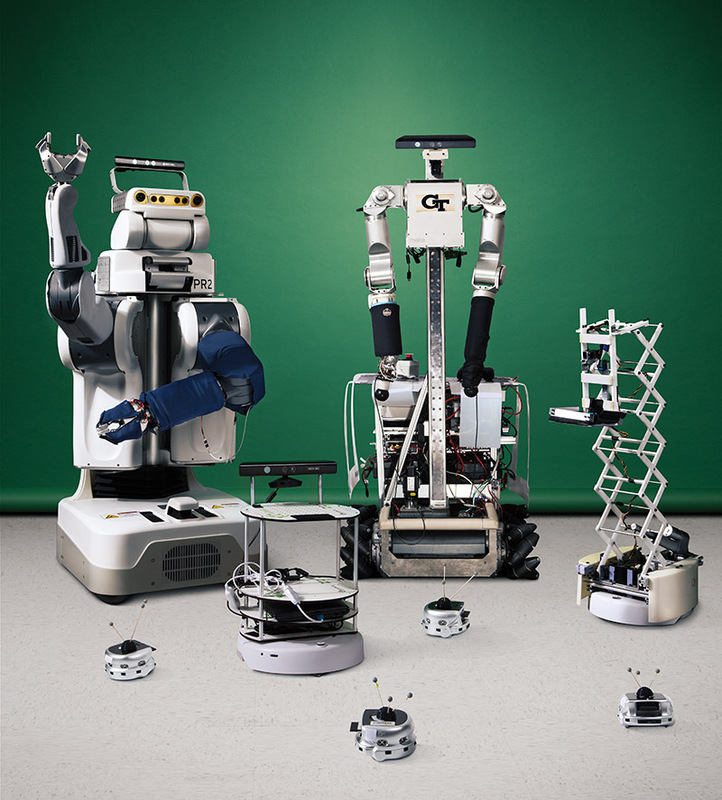 Someday “swarms” of bots might be used for serious tasks like search and rescue missions. This bot can navigate your home, plotting a 3-D map and taking pictures. It also makes a nice mobile end table that can deliver snacks from the kitchen.